Someone might have asked you if you were "self-employed." Maybe you're not sure what that term means and whether it applies to you. Let's take a look at what it means to be "self-employed. Someone who is self-employed is the owner of a business, an individual who earns a living by working for himself/herself and not as an employee of someone else. as a member (owner) of a limited liability company (LLC). The IRS says that a self-employed individual is someone who "owns an unincorporated business." If you are in business for yourself, or carry on a trade or business as a sole proprietor or an independent contractor, you generally would consider yourself self-employed. This definition also includes solo owners of an LLC. As a member of a partnership that carries on a trade or business, or as a member of a multiple-member Limited Liability Company (LLC) that chooses to be treated as a partnership, your distributive share of its income or loss from that trade or business is included in your net earning from self-employment. The IRS considers you to be self-employed for self-employment tax purposes if you receive a 1099-MISC form as a non-employee. What does this mean? An individual who is self-employed must pay self-employment taxes (Social Security and Medicare), while an employee of a company must pay half of these taxes and the employer pays the other half. Self-employment is sometimes (wrongly) equated with the sole proprietorship, but someone who is a partner in a partnership or a member of an LLC is also considered self-employed. What's the Opposite of Being Self-employed? Being an employee: A self-employed person is not an employee and doesn't work for an employer for wages or salary. Being a corporate shareholder: A shareholder is not self-employed, but is one of the owners of a corporation, receiving dividends based on his or her shares of ownership. Corporate owners who are corporate officers and who work in the corporation are considered employees, not self-employed. ​How Do Self-Employed Individuals Pay Income Taxes? If you are self-employed, you pay income taxes on your personal tax return (called "pass-through taxes"). If you are a sole proprietor (or single-member LLC) you must complete a Schedule C and you pay self-employment taxes based on the net income from that business. For partners in partnerships and members in multiple-member LLCs, the path to determining your income tax is a little more complicated, since you first must prepare a partnership tax return (for LLCs also) and then a Schedule K-1, which shows your share of the income of the company. A self-employed individual must also pay self-employment taxes on the profits of the business each year. Losses from self-employment may be used to offset income to the individual from other sources. The 2017 Tax Cuts and Jobs Act has made some changes to the way self-employed individuals are taxed. 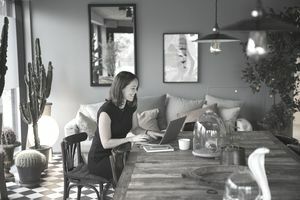 Some self-employed business owners may benefit from the regulations in this law, by being able to take a 20 percent deduction from net business income, in addition to regular expense deductions. This new provision is complicated and there are limits and exclusions. Check with your tax professional before you attempt this deduction. Are S Corporation Owners Self-employed? S corporation owners are considered self-employed in the same way as do partners in a partnership. S corporation owners receive a distributive share of the company's income, just as partners in a partnership. If the S corporation owner works in the business, they are paid a salary and must pay FICA taxes.